GENEVA (AP) — The United Nations’ human rights chief has delayed publication of a report on companies doing business in Israeli settlements in the West Bank, saying in a letter made public Tuesday that her office needs more time to carry out a complex and unprecedented task — one with deep political implications. The decision by High Commissioner for Human Rights Michelle Bachelet, a former president of Chile, followed a campaign by the United States and other countries to squelch publication of what Israel has described as a “blacklist” that could drive away companies. 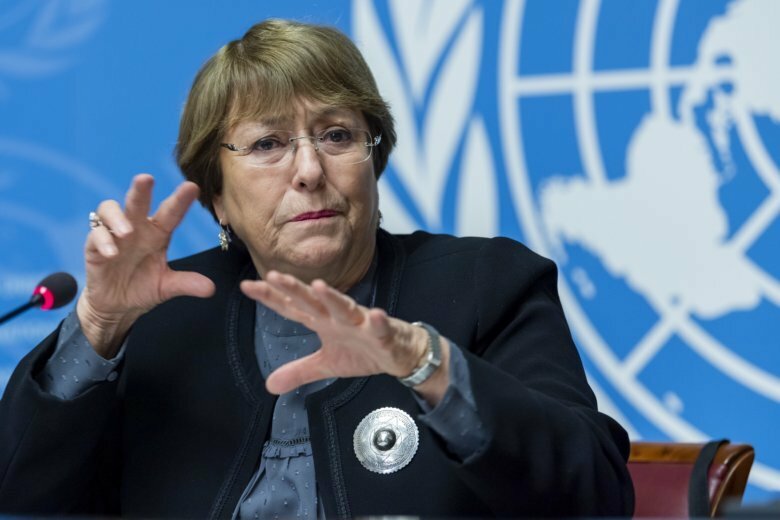 The U.N.-backed Human Rights Council in 2016 instructed the office Bachelet now oversees to create a “database” of companies deemed to be linked to or supportive of the settlements, which are considered illegal by the vast majority of the international community. The council, which is made up of 47 governments, had never before requested such a list scrutinizing corporate activities. The letter Bachelet sent to the council’s president, Ambassador Coly Seck of Senegal, on Monday cited the “complexity” and “novelty” of the assignment. She wrote that she was committed to fulfilling the council’s orders, but “further consideration” was needed. Bachelet said the office she has overseen since September has a “view to finalizing this mandated activity in coming months” but her letter did not give a more specific timeframe. Supporters of the report say the credibility of the U.N.’s top human rights body is on the line. They want Bachelet to set a clear date for publication to raise pressure against the Israeli settlements. The report has been delayed before. It was expected to be published during the council’s current session, which ends March 22. U.N. officials have said the human rights office received no additional resources or funds for a project that has involved reaching out to scores of companies, governments and advocacy groups. Last year, the rights office said 206 companies, mostly Israeli and American, were facing a review of business practices involving the Israeli settlements. It did not identify any companies by name. Israel has long claimed it is unfairly singled out by the council, whose members include some countries with poor human rights records themselves. Israel is the only country in the world whose policies automatically face scrutiny at every council session. The United States has called the council’s resolution emblematic of an alleged anti-Israeli bias at the U.N.-backed body. The Trump administration cited the alleged bias as a leading reason it withdrew the United States from the council last year. Proponents of the resolution insist companies must be held accountable for their activities in Israeli settlements, arguing that those actions can contribute to injustices against Palestinians. Over 600,000 Israeli settlers live in the West Bank and east Jerusalem, territories captured by Israel in 1967 and claimed by the Palestinians as parts of a future independent state. Critics say publication of the database would amount to a stamp of approval from a U.N.-backed body to the “Boycott, Divestment, Sanctions” movement, which urges businesses, artists and universities to sever ties with Israel. Activists in the Palestinian-led BDS movement say they are using nonviolent means to resist unjust policies toward Palestinians. Israel says the movement masks a deeper goal of delegitimizing or destroying the Jewish state. Israel’s Foreign Ministry called Tuesday on the council to halt any action in the economic sphere that could hurt residents of the area. Josef Federman in Jerusalem contributed reporting.